Prince Harry is set to marry actress Meghan Markle in May 2018, but she won't be called Princess Meghan after the wedding. American actress Meghan Markle is getting married to Prince Harry — but don't expect her title to be Princess Meghan in May 2018. 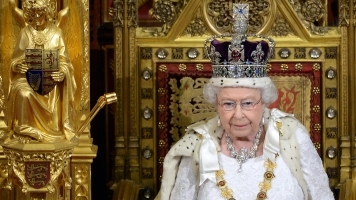 The British royal family has pretty strict rules about titles. And the designation of prince or princess is generally reserved for those born directly into the royal bloodline. In 1917, King George V decreed only the children of the king or queen, the children born to the sons of the king or queen and the oldest living son of the oldest son of the Prince of Wales can receive the title of prince or princess. That's how Queen Elizabeth II's daughter, Anne, is technically a princess, as well as the queen's granddaughters Beatrice and Eugenie. They're the daughters of Elizabeth's son Andrew. Charlotte, the daughter of the duke and duchess of Cambridge, is a princess because the queen issued a decree in 2012 extending the prince and princess titles to all children of the oldest son of the Prince of Wales. So after Markle weds Harry, she will take on his title and name, becoming Her Royal Highness Princess Henry of Wales. If the queen gives the prince a royal dukedom, Markle would officially become a duchess. Queen Elizabeth did this exact thing when Prince William and Catherine Middleton married in 2011. One notable exception to the U.K.'s royal protocol on titles is the queen's husband. When Philip married then-Princess Elizabeth, he was named the Duke of Edinburgh. After Elizabeth became queen she officially granted her husband the title of a British prince.